What does a divorce really entail? Can you even afford a divorce? Here are some critical actions you should take to protect yourself BEFORE you file for divorce. We respect your privacy and will not sell, rent, or share your email address with anyone. 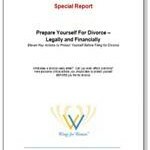 As a bonus, you will also receive our free monthly e-newsletter containing helpful tips on navigating a divorce and creating an ideal life after divorce.